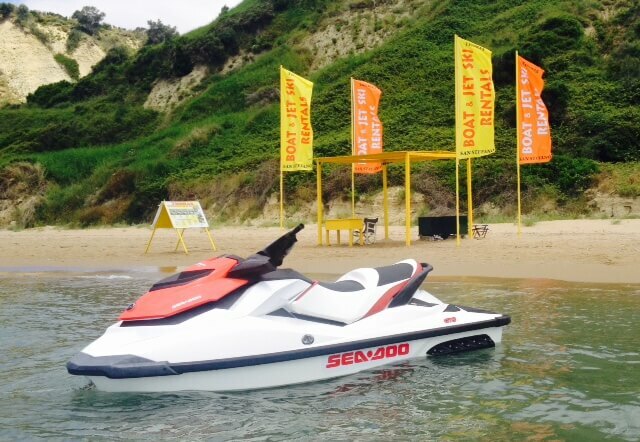 Thomas Boat & Jet-Ski is located on the San Stefanos beach, North Corfu, next to the village Arrilas. We can confidently say that we offer the Grand Strand’s finest in watersports rentals. Our staff will make you feel safe and comfortable. You will take home not only great memories but great friends. Whether you are taking out a boat for the day or ripping through the water on a jet ski, you will most definitely leave with a smile. Take yourself away from all of the hotels and busy roads and get swept away into the pristine natural environment that San Stefanos Beach has to offer. We will show you a different side of the Grand Strand that you will appreciate for years to come. For those who want to take adventure and excitement to the next level we have the hour and a half Extreme trip out to the sea. Jump the waves and drive it like you stole it for this thrill seeking trip. Safety is of our utmost concern and that is why every jet ski trip is accompanied by one of our highly trained and friendly staff to ensure that you have the most memorable experience possible. Come check us out — we would be more than happy to answer any of your questions and make your reservations! Whether you are taking out a boat for the day or ripping through the water on a jet ski, you will most definitely leave with a smile. You will take home not only great memories but great friends! Contact us regarding any questions you might have or to make a reservation. Copyright © 2019, Thomas Boat and Jet Ski Hire. Website created by Tasos Koufalis.